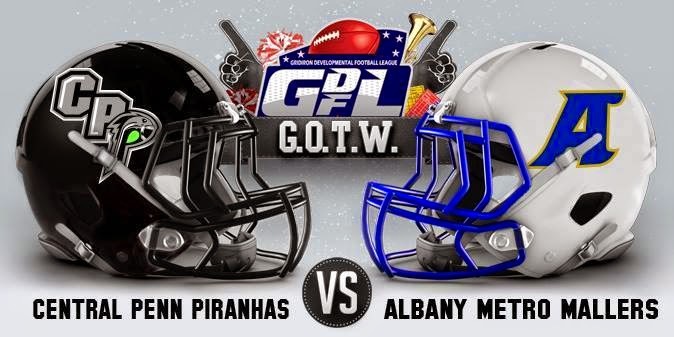 Coming off a convincing 66-0 win over the Lancaster Lightning on the road last weekend, the Central Penn Piranha will return home to face the Albany Metro Mallers on Saturday in the GDFL Game of the Week. The Piranha, 3-0 and ranked third in the nation by the Gridiron Developmental Football League, will host the Mallers, ranked 21st, at Warwick High School in Lititz, PA. Both the Piranha and the Mallers returned to the GDFL in 2014 after winning championships in the RAFL and SPFL leagues, respectively, in 2013. The two teams have combined to outscore their opponents by scores of 123-to-48 in five games this season. Central Penn and Albany have historically been two of the better teams in minor league football, with talent that has not gone unnoticed. Earlier this year, Mallers receiver C.J. Tarver was asked to try out for the CFL's Winnipeg Blue Bombers. More recently, former Piranha receiver Terrill Barnes was invited to try out for the NFL's Washington Redskins. Kickoff for Saturday's showdown at Warwick is scheduled for 7 p.m. ET.